The Russian authorities have presented a prototype plastic card for the country’s new national payment system; 10 banks have already shown interest. According to experts, the promotion of the new card will take several years, but the process can be accelerated by the mandatory switching of state-owned corporations to the new card. The Russian authorities have created a prototype national payment card for use in the country’s new internal payment system, Russian business daily Kommersant has reported. 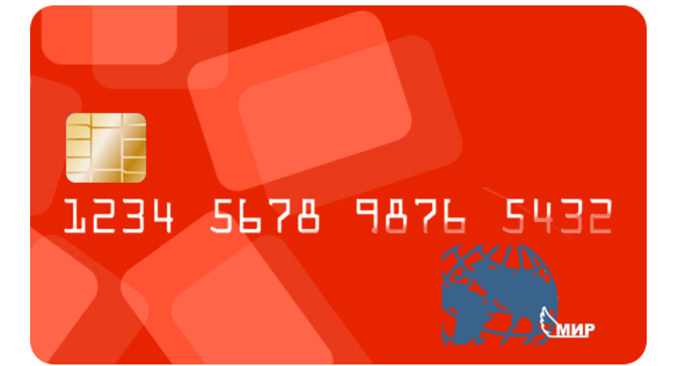 Mass production of the new payment card, called Mir (World), will begin in 2016. As the Central Bank's deputy head Olga Skorobogatova stated at the official presentation of the card in Moscow on May 29, American payment system MasterCard and Japan’s JCB have already expressed interest in issuing co-branded cards with the new system. The creators of the new card see the payment systems of the BRICS countries as future partners, she said. According to Ilya Balakirev, chief analyst at investment company UFS, the system is being created “at a rapid pace,” which has already led to “various kinds of technical problems.” It will take some time to become clear whether the system receives the support of the population, said Balakirev. The issue of the payment card is part of a large-scale program to create an autonomous financial system in Russia, launched as a countermeasure to the sanctions imposed against Russia by the U.S. over Moscow’s role in the Ukrainian crisis, which resulted in international payment systems Visa and Mastercard ceasing to process card payments for customers of several Russian banks in March 2014. To avoid a repetition of such a situation, on April 1 Russia launched a national payment system, in which payments are processed within Russia. The issuing of plastic cards is intended to be the next stage of the implementation of the system, which Visa and Mastercard have now joined. "The idea of establishing a national payment card was not a direct result of the sanctions,” said Dmitry Bedenkov, head of the analytical department at Russ-Invest. “Although the activation of the process began after the introduction of sanctions, this topic had been discussed to varying degrees earlier. The transition to a sanctions regime just increased the relevance of creating domestic payment systems," he said. According to the Central Bank, 10 Russian banks are ready to issue the new card, including the sanctioned Bank Rossiya and credit institutions in Crimea, where all recognized international payment systems pulled out following the imposition of sanctions and Russian banks have so far yet to venture. Incidentally, proposals for co-branding do not apply to the banks under sanctions. According to Anton Soroko, an analyst at Finam Investment Holding, the physical production of a plastic card is a fairly cheap process, which cannot be compared to credit institutions' other operating costs, such as marketing costs or payroll. A helping hand from the state? "It will take at least another few weeks for the prototype payment application for the Russian national card Mir to pass tests and show satisfactory results," said Vasily Yakimkin, associate professor of the Finance and Banking Faculty at the Russian Presidential Academy of National Economy and Public Administration. According to him, in order to expedite the work on developing the card, the Russian payment system may conclude special agreements with international operators like Visa, MasterCard or China UnionPay. However, as Ilya Balakirev pointed out, the market is very sensitive to regulation in the payment system segment, and administrative resources can do a lot to smooth the way forward. In particular, he said, the state may oblige state-owned corporations to switch to the new Mir plastic card, meaning many large companies will begin working with the system. Furthermore, with Visa currently leading the market, the other international systems will willingly agree to launch co-branded products in order to gain some advantage, said Balakirev.